The Only Unbounce Template with FullScreen Video Header! Remote is a stylish lead gen Unbounce Landing Page Template with video header designed to quickly attract, collect and convert. With a clean design and strong visuals this Unbounce Landing Page would work great for just about any need including, app showcase, startups, products, vacations and real estate. 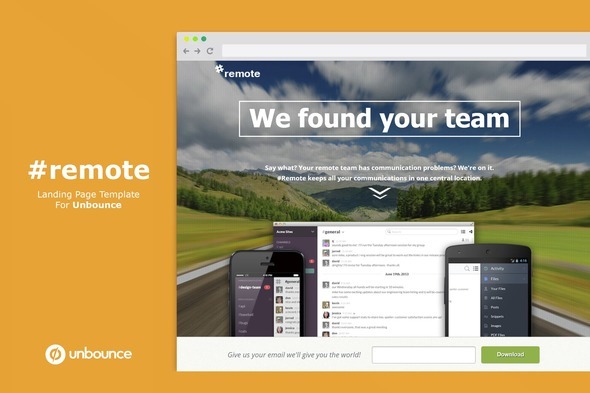 Please note, #remote is an Unbounce Template, it’s NOT an HTML/CSS Template. You can learn more about the powerful Unbounce platform here. Mobile detection script displays mobile version automatically when accessed from a mobile device! If you like this Unbounce Template, please don’t forget to rate .